This super-healthy winter salad makes a great first course for a dinner party, or a delicious and hearty lunch. The kale and beets can stand up to the dressing, so you can make it ahead of time and take with you to work. To make the vinaigrette, combine all ingredients in a Mason jar. Close jar and shake vigorously until emulsified. Dressing can be made three days ahead. Separation is natural; just shake again to combine before dressing your salad. 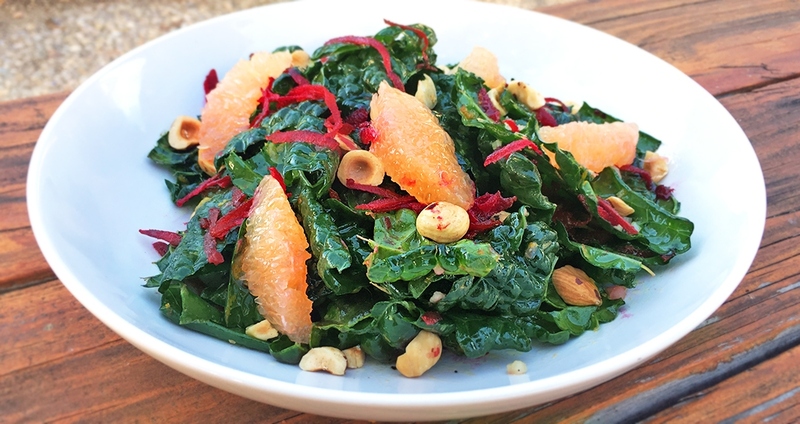 To assemble salad, combine kale, beet, grapefruit, hazelnuts, and cheese (if using) in a large bowl. Toss with dressing and allow to macerate for 5–10 minutes before serving.